Breakfast today was delicious, as always. 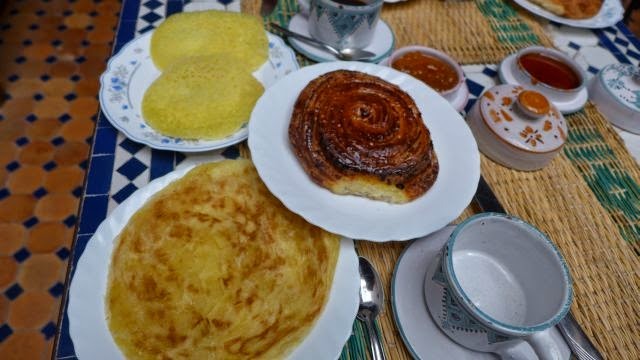 The riad staff keep on adding food on our table with a variety of breads and then making omelette. While enjoying our never ending food supply, an older couple who was sitting beside us striked up a conversation. The elder man is an English teacher in Germany and was travelling around Morocco for the summer holiday with his wife. They shared their travel experiences around the world. The man had stayed in Indonesia before for a while so he still remembered a few words and practised them on us. Cute! 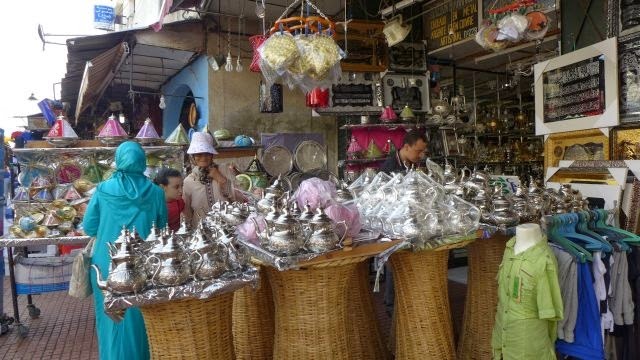 After breakfast, we ventured out to the medina to find the teapots, but most of the souvenir / artisan shops were still closed. After buying some mint tea powder, we walked a bit until the Avenue Al-Marsa by the river Bou Regreg to kill time. We watched some kids fishing and swimming there. We turned back to the medina at 10am and saw that some souvenir shops had already opened. We only found an artisan shop open after the third round of going through Rue Souika. We wasted no time and bought our teapots there. We bought the medium sized teapot (suitable for 2 persons) for MAD 60 (RM 22) each. From the riad, we walked to the train station about 1km away with our luggage. It didn't seem too far as we were passing by shops on the way to the train station. 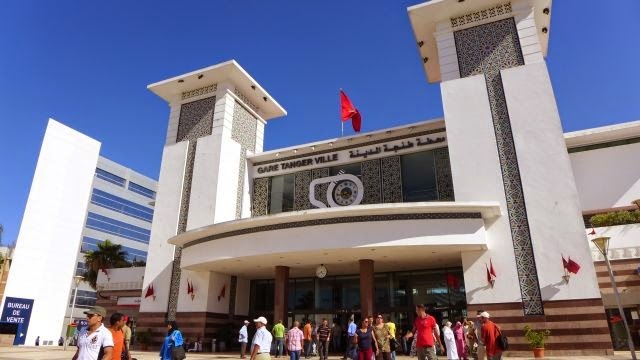 The journey to from Rabat to Tangier is about 250km and took about 4 hours. Rabat is not the first station on the Morocco - Tangier route so we couldn't get any seats until we reached the second station. 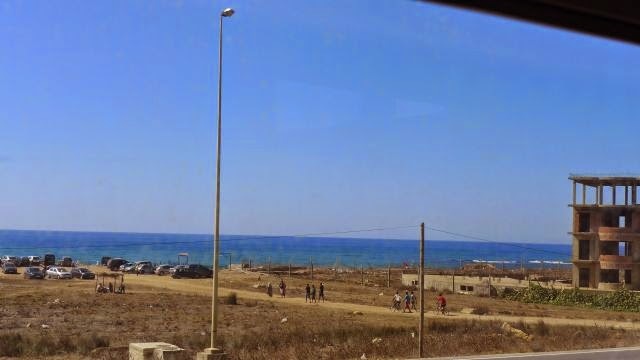 We passed by a sea side city - Asilah on the way to Tanger. Otherwise, the view was more desert and some plantation. We arrived at Tangier around 16.30 hrs and then walked a bit to evade a taxi driver who was pushing us to ride his taxi. Unfortunately, we couldn't get any petit taxis who could speak English and didn't know the location of our Hotel Royal. So we had to turn back to the train station and managed to find a taxi driver who spoke English and who knew where our hotel was. However, he did not use the meter and charged us an amount I could not remember now. We had to agree to it as we couldn't find other taxis who could bring us there. 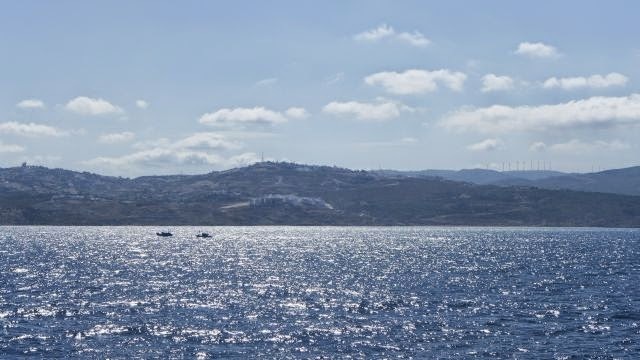 Tangier is a sea side city at the northenmost tip of Morocco and is separated from Spain about 38km away, only by the narrow Strait of Gibraltar where the Mediterranean Sea meets the Atlantic Ocean. 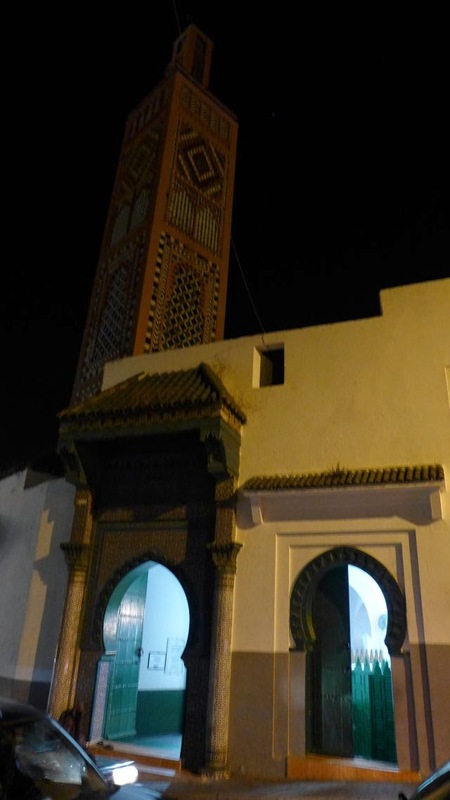 Tangier is also the birthplace of the famous voyager Ibn Battuta, his tomb is located in this city. 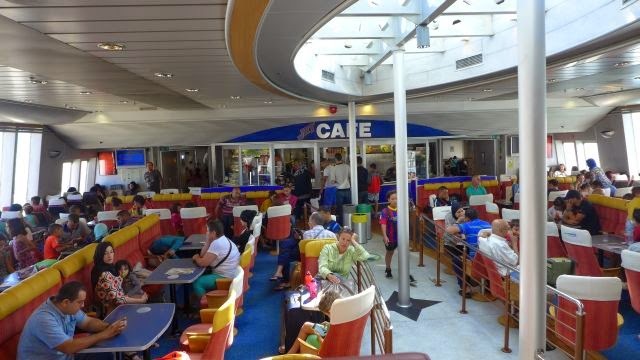 You can find many Europeans here as they can easily enter via the ferry from Spain, only 1 hour away. Europeans can also bring in their vehicles via the ferry so you can also see many European registered cars here. 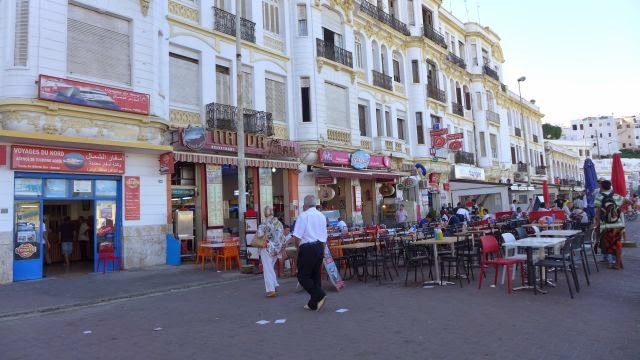 With the influx of Europeans, the city has become more westernized compared to the other Moroccan cities, as evident by the many restaurants serving liquors along the beach front promenade at Avenue Mohammed V.
This time we were not staying in a riad but at a 'hotel'. To tell you the truth, it is more like a motel. Hotel Royal costs EUR 28 (RM 115 ) per room per night. 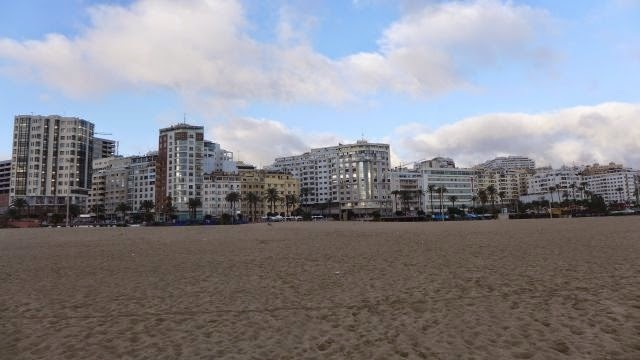 I didn't feel the need to book a fancy hotel as we were just staying the night to catch a ferry the next day to Spain! 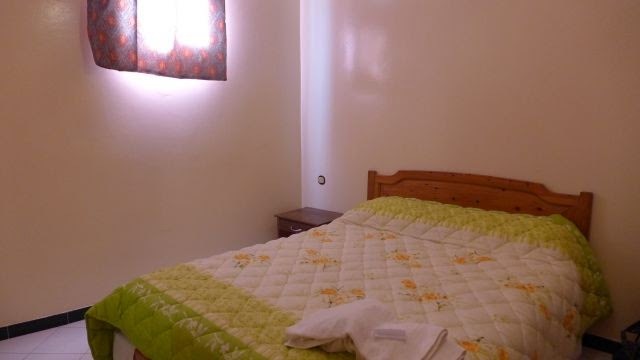 Based on the location, this hotel is near to the ferry station which is within walking distance and near to the beach. It is better to stay at another place rather than this one as there is no air cond in the room! , not clean (cockroaches running around), no lift (we had to climb the stairs to the 3rd floor), no breakfast, the wifi signal is not strong - we had to go down to the lobby to get wifi and it was noisy at night - you can hear noises from the other rooms - people talking, taking shower etc - reminded me of staying in dorms in university. But then again, this is the price to pay for staying in a budget hotel. We quickly made our way out to find dinner at the nearby restaurants - not really by the beach but by the walkway facing the sea on the other side of the road. We ordered beef cous cous and seafood paella - already craving for Spanish food! 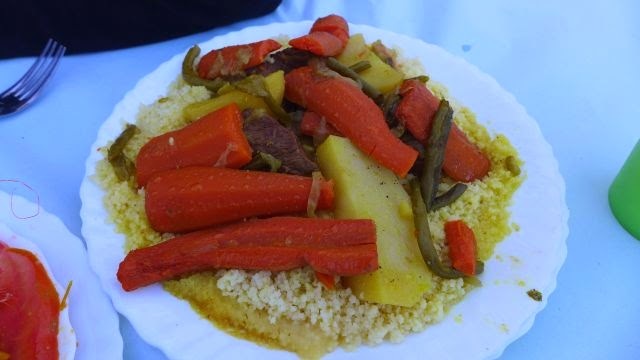 The cous cous was good. 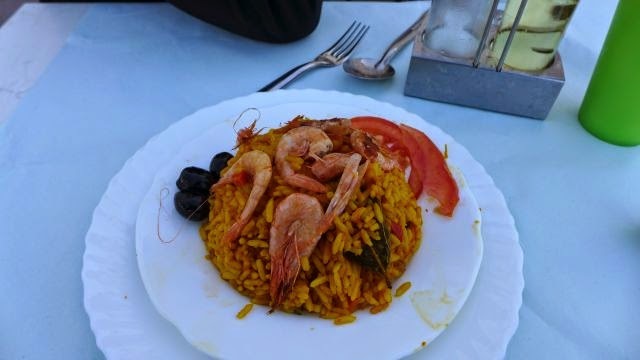 However, for the paella - it is better to leave it to the Spanish to cook (it tasted like fried rice). After dinner, we walked to the ferry terminal to purchase the ferry ticket to Tarifa, Spain for the next day. However, we were only allowed to buy the ticket upon boarding the ferry, i.e. we had to buy our tickets the next day. The first ferry out is at 8.30 am, followed by 10.30 am. We planned to catch the bus from Tarifa to Seville at 12.30 hrs the next day, so both timings would be able to accommodate us. The ferry ride would only take 1 hour. 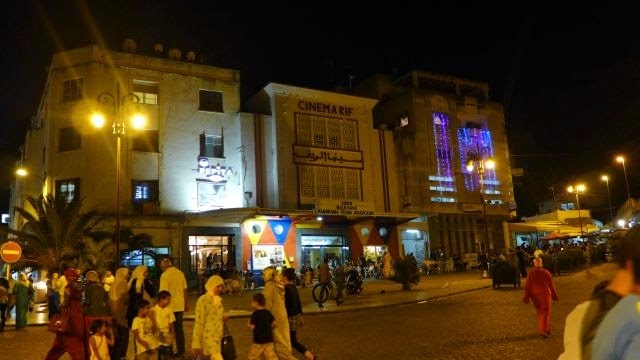 We returned back to the street at our hotel but continued ahead to the medina of Tangier. We didn't buy anything here, just taking pictures. 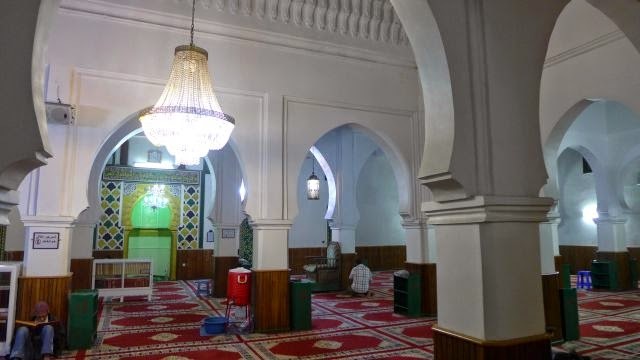 Since we forgot to go in Koutoubia Mosque in Marrakech and didn't go to any mosques in Imlil and Rabat, we took a picture of a mosque nearby the medina of Tangier. 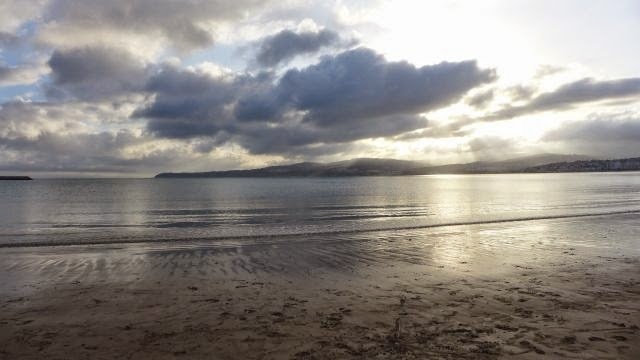 We walked to the beach in the morning since we didn't get the chance to do so in day light yesterday. 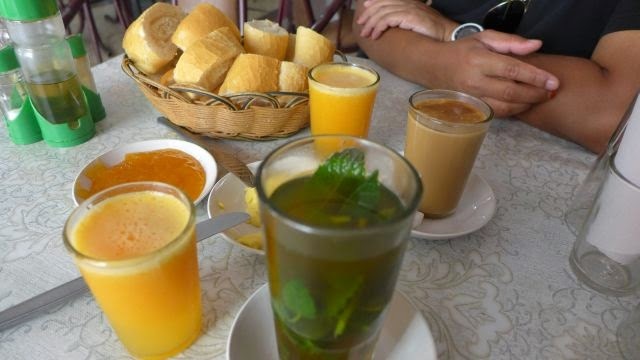 Since our hotel did not provide breakfast, we went to a cafe in front of our hotel to get a breakfast set of bread with jam, tea and juice with additional omelette. After breakfast and checking out, we walked to the ferry terminal and purchased our tickets to Tarifa, Spain for the 10.30am ferry. Our ferry costs MAD 390 (RM 145) one way per person. 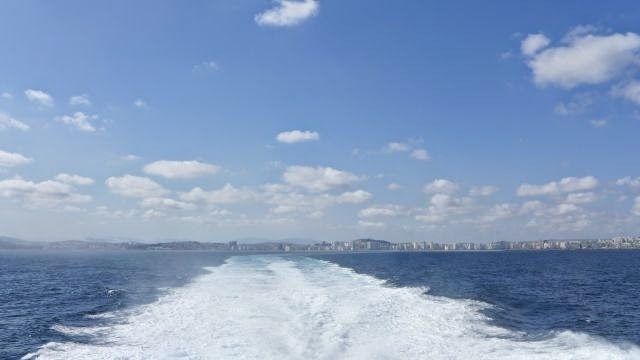 Our ferry would take 1 hour to Spain. The immigration check at the terminal was smooth, there were not many people in the queue, perhaps most of them were already in the ferry, since it was already 10.15am. 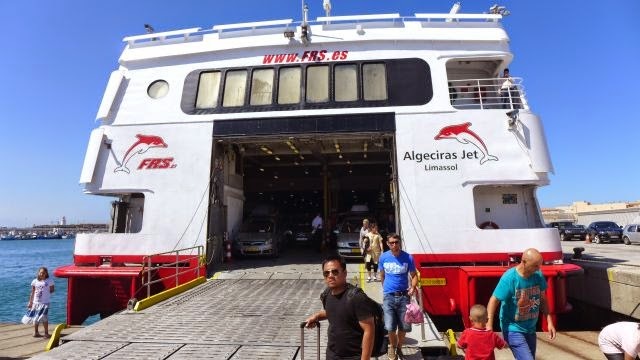 The ferry is air conditioned and also carries vehicles. There's a cafe inside, however it only accepts Euro. Looks like we had to bring back some spare MAD home as souvenir. 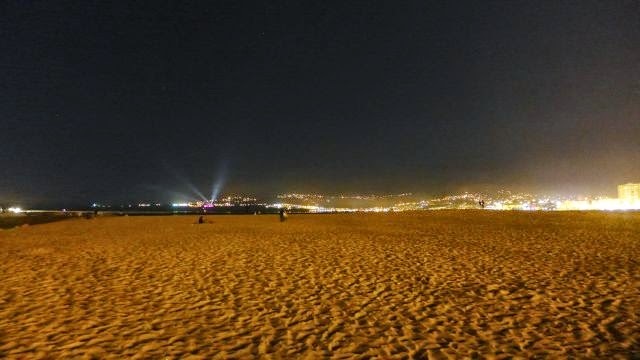 It was a great experience travelling thorugh Morocco in the short space of time (7 days ) and we only visited Marrakech, Imlil, Rabat and Tangier. We would have wanted to visit Fes and Meknes but didn't have the luxury of time as we would be travelling to Spain in the next 7 days. Thank you Morocco for the invaluable experience, we certainly enjoyed the journey and learnt a few things on the food, culture and language. We hope to come again and complete our adventure!